Here is my review of John Cheever's book The Enormous Radio and Other Stories. In this collection are 14 short stories from the late 1940s to the early 1950s which had appeared separately in New Yorker magazine, which became a showcase of Cheever’s rare talent. In these stories, Cheever is seen abandoning his early realism in favor of introducing an element of fantasy into his narratives. His characters seem unprepared and unsatisfied with life in the big city, and the emotional conflicts and spiritual emptiness that comes with it. The typical Cheever protagonist is affluent but emotionally distressed, and in conflict with his spouse. 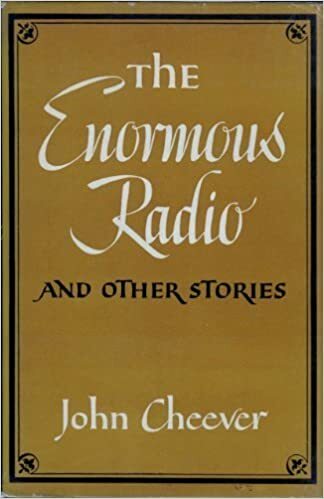 The title story “The Enormous Radio” combines Cheever’s early realism with a touch of magical fantasy, yet the fantasy is restrained and mixes in with the realism. A married couple buy a new radio that they soon discover has the ability to broadcast private conversations taking place anywhere in their apartment building. They listen to their neighbors’ arguments and wonder if they themselves are happy. Not long afterward, their own conversations mimic those on the radio. One of Cheever's most anthologized stories, it made an impression on me as a writer and inspired my own short story "The Smartphone." Cheever was known as a short story master, though he wrote some good novels as well, such as the Wapshot Chronicle, which won a National Book Award. In the second half of the 20th century, when anyone thought of the best American short story writers, Cheever was on the tips of most lips. He and John Updike appeared frequently in the pages of the New Yorker, probably the most influential publisher of short stories in those days.